In a campaign to reduce worldwide rates of obesity and tooth decay, the World Health Organization (WHO) recommends that adults and children reduce their daily intake of "free sugars" to less than 10% of their total energy intake. Taking it a step further, for real health benefits, WHO suggests capping sugar consumption at no more than six teaspoons per day. What are free sugars? They are the sugars known as glucose, fructose, sucrose and table sugars that are added to processed foods, as well as the sugars that occur naturally in honey, syrups, fruit juices and fruit juice concentrates. (The free sugars found in fresh fruits, vegetables and milk don't count as unhealthy.) Too many free sugars in a diet can result in obesity, and can be harmful to oral health, often leading to gum disease and tooth decay. Unfortunately, cutting back on free sugars is easier said than done. Much of the sugars consumed today actually are hidden in processed foods that aren't typically considered "sweets." Just one tablespoon of ketchup, for example, contains a full teaspoon of sugar. Slathering ketchup on a burger and washing it down with a can of non-diet soda can result in consuming about two days' recommended sugar intake in just one meal! The best advice: read labels. 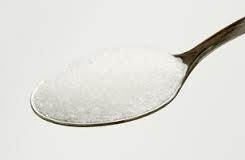 Six teaspoons of sugar is equivalent to 30 grams. Be on the lookout for non-sweet foods that may still contain lots of sugar. Keep the sugar in check, brush and floss daily, and your bathroom scale, and oral health, will thank you.